I would have stuck fax on the end there as well, but I couldn’t fit it in. Occasionally, I will phone people up and I will get an answer machine or voicemail. Now, I do mean an answering machine, the thing next to the phone, next to the landline. This is not the 1980s, or 90’s. It’s the new era and I am talking business, so you do what you like at home, but for your business you need to get with the times. There are services that will do the job for you. When somebody rings you up, they want to speak to somebody. It is very very rare that someone rings up hoping to leave a message on an answering machine on the off chance that soon, one day soon, perhaps tomorrow, you will ring them back. Because now it’s fast, no’s one got any patience, it’s horrible, everyone wants it now. And quite often the place they found your phone number is on the Internet, they’ve searched the Internet and, I know, you’ve got to sleep some point. People don’t know where you are quite often in the world and something like Amazon, I’m pretty sure you can ring them twenty four seven. My business, Fire Protection Online, you can ring us I think twenty four seven, you can at least ring seven days a week, you can definitely ring us on bank holidays, you can definitely ring us on Christmas Day and somebody answers the phone, somebody knowledgeable, someone who can talk to you and someone who can help you. We have customers who have nightclubs, run restaurants, and they get home at two or three in the morning. They do their business office work then, because after that, they go to bed and they wake up at lunch time. Then they breakfast when they get up and then they go to work. People work strange hours, some people work night shifts, they want to buy and they want to talk when it’s convenient for them. They don’t want to do it when it’s convenient for you and so really it’s no excuse. Of course you are on your mobile phone, so you’ve got your automatic voicemail, it’s easy. So if you are in the construction industry, if you are a builder or if you are driving a vehicle or something, you’re going to say well I am out all day, obviously can’t answer the phone when I am working, people have to go to voicemail. No, they do not. There are services and they are really easy to come by. You can get yourself a special number, you can get yourself a toll-free number. In the UK for example, we use Number Store. What happens is, with them you don’t even have to have one of their numbers. You can rent or buy a 0-800 number, which is like a 1-800 number, 0-345 are they now, or any type of number you like. And you input your mobile in their online dashboard, they will talk you through if you can’t figure it out, but it’s just a point and click, it’s very obvious to do. And it will say “If you don’t answer your phone within the first three, four, five rings, it will then diverted to this number”, and you give another number of say an answering service, meaning real people who you pay a monthly fee to. Then it in addition just to have them available, and in addition when they answer a call, they will charge you a certain rate by the minute or half minute. And it’s not expensive. We use these and we have people phoning us all day long, and into the evenings and we use them as an overflow. So you can have, a hunt group (which is what it is called) and you could say if it’s not answered within say three, four, five calls, you set that, it then goes to this number seamlessly so the person on the other end doesn’t know. And then they pick it up if they are not very close to another one or something like that. And finally if you are desperate or after a certain hour, you can send it to voicemail if you so want. For the first couple of years at least of my Fire Protection Online business, when I was packing and sending stuff out because it was just me, I went to one of these services. They would use a system that would automatically text me that message, who it was, what time and a phone number. And I could have asked for it by e-mail or I could’ve got them to call me or divert the call to me or something like that, it was just simple to do that. Then I got them when I had a minute I just picked the phone up, rang them and said ‘”Hi, Jon here, Fire Protection Online. Sorry I couldn’t take your call a minute ago, but how can I help?” Never a problem. And this used to happen when I was abroad on holiday, That’s how I managed on my own. 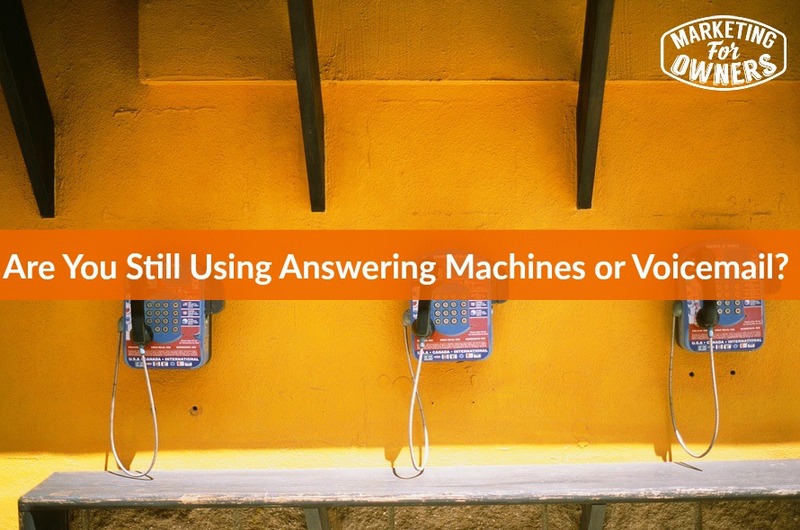 So please, there is no need to use voicemail, answering machines and such. There are services, just Google “telephone answering service”, just Google it because I can’t really advise you on your nearest one. But there is Ring Central, there is Grasshopper; I think they might have been bought out by, I’m pretty sure it would still be called Grasshopper, massively successful. This is suitable for all businesses, they will tell you exactly how it works. These people, surprisingly, will pick up the phone. In Fire Protection Online, we use Go Response, which is a British one, we have used them for years. There is a very successful one for small businesses called Money Penny. I’m sure I’m going to give them a go at some point or other. And there are loads, just loads. So please, treat your customers with the respect they deserve, they want to be talked to, they don’t want to leave messages. You got no excuses, please. In Fire Protection Online, just to let you know, we have people who answer the phone all day, but there will be times when there’s like six or seven or eight calls coming in at once. We don’t have, we have a phone system, we do not have an answer phone, we simply don’t have one. If it’s not answered within something like two rings, it goes seamlessly to an overflow call center at Go Response would have all the scripts and then if it needs to come back to us, they would field it back to us if they can’t field, but it’s, you will love it. By the way, tomorrow is really exciting! Remember Wednesday is the expert interview series, tomorrow is John Lee Dumas, the John Lee Dumas, yes of Entrepreneur on Fire, EO Fire, fantastic. I interviewed John and seriously, I had fun, I had a big smile on my face, I had fun. You get the impression me and him are best buddies. So listen in tomorrow, you will love it.